St Andrews forward Jack Wilson (9) puts pressure on the home goal. Pic by Blair Smith. 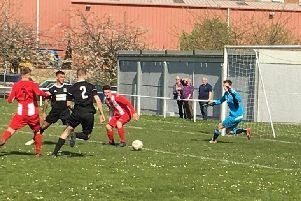 St Andrews United were optimistic that the team could pick up three points away in West Lothian but it wasn’t to be. Saints spent most of the first 45 minutes in Blackburn’s half but just couldn’t score from the chances created. Blackbrun took the lead when a Blackburn cross hit the arm of a chasing Saints defender. Referee Maclean decided it was a penalty offence which was converted well by Downie into the corner. Paul Quinn got a shot away shortly afterwards for United but it went wide. The visitors continued to press forward and a good chip forward saw Jack Wilson in space but he headed it just wide. In first half injury time McInnes played a great chip forward but a glancing header towards goal saw the home keeper bring off a fantastic save and retain his team’s one goal lead into the break. Downie of Blackburn had a good shot saved by Lee Wilson. Saints, attacking from the pavilion end, moved up but attacks failed several times at the final pass. Once again Blackburn, on 64 minutes, caught United on the break up the stand side and a fast low ball across goal saw Downie beat defenders either side of him to slot it past Lee Wilson. A chance for Saints came when Cunningham managed to get a pass to Quinn but his effort went over the bar. Burn increased their lead on 71 minutes when an excellent header from Bain hit the back of the net from a good free kick. Two mins later it was 4-0 when a shot was side footed into the far corner of the net by McDowall. Saints pulled one back when Cunningham was on hand to put away a decent pass by Quinn. Lee Wilson was sent off when he received a dissent yellow for dissent. In the end United were glad to hear the final whistle to bring to an end a tough 90 minutes. St Andrews: L Wilson, O Fleming, Mcinnes, Cunningham, Stark (Falconer64), Quinn, J Wilson, Rendall, S McDonald, D Fleming, Blaney (Tabwenga75).